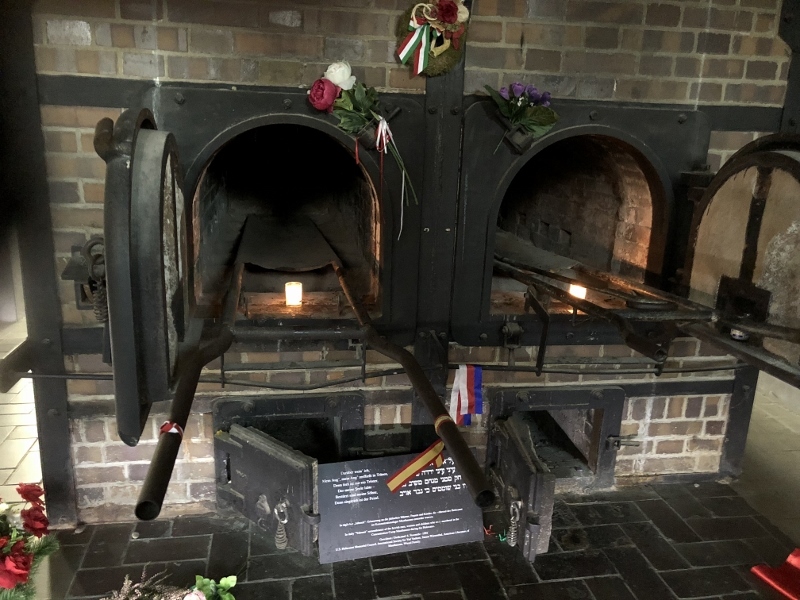 Chances are we may never make the trip to Auschwitz so when the opportunity arose to take an excursion to another concentration camp, we took it. I’ve always been touched deeply by the Holocaust and what it unleashed in the world. 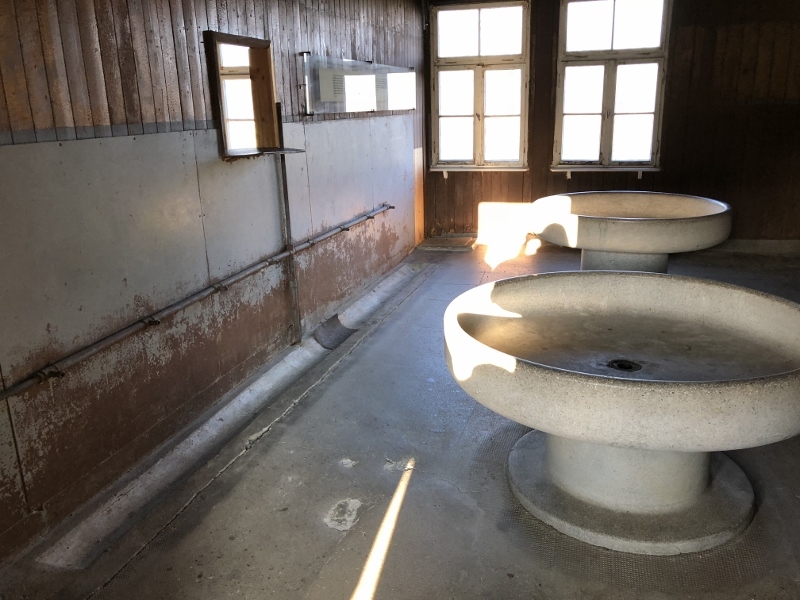 The trip to Mauthausen was another reminder and an opportunity to pray that the hatred in the world and the quest for power would be replaced with the peace and love for one another that God intended. The sun was shining brightly when we drove through the countryside to just outside a small town where the camp was built. 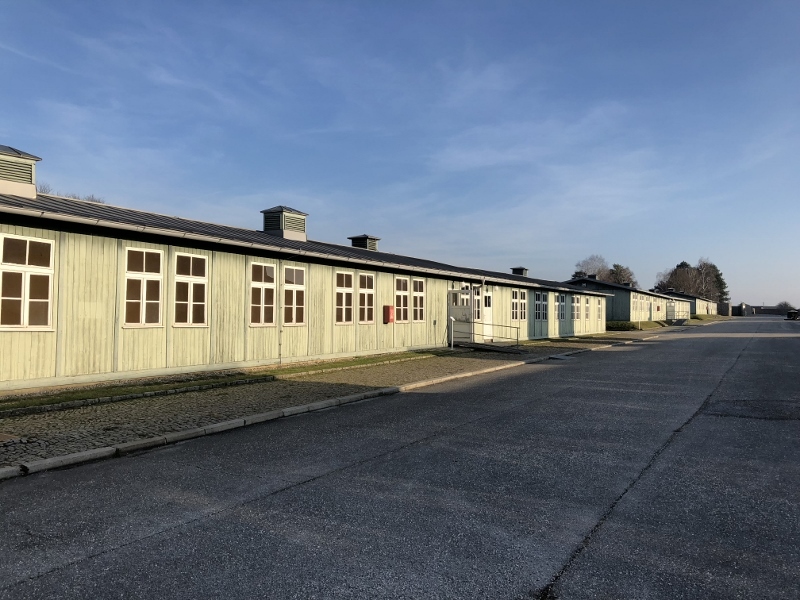 It was actually referred to as a labor camp as those who were brought there (men mostly followed by a few women as the years went on) were forced to work in the large granite quarry where the camp was built. Mauthausen survived the years after the war much better than some of the other camps as it was built from the stones dug from the quarry and carried on the backs of the prisoners. We left our bus and walked to the entrance where the officers cars would enter and leave. There was a large swimming pool there and our guide told us that the officers’ families would enjoy the pool while just on the other side of the fence people were dying from the conditions in the camp. Walking some steps up from the garage area, we found ourselves standing in front of the entry gate. That was the first thing the new prisoners would see as they were led up by foot from the village road below. Looking through the gate as our guide spoke, I could imagine prisoners lined up in the parade area between the barracks before us, shivering from the cold or oppressed by the heat of the day. Our guide walked us through one of the three original barracks that have survived. I believe there were at least 20 that housed prisoners and at one point they were so full that a group were put in an open area outside or made to work 24/7 because there was no place for them to rest. The buildings across from the barracks were used as a kitchen and a “medical building” among other things. 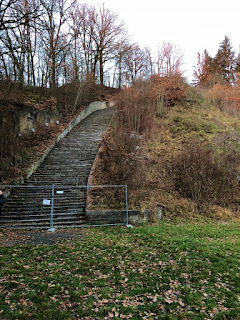 The medical building was where prisoners who could no longer work or make it up the “steps of death” (186 steps that led up out of the quarry) with their hundred pound quarry rocks on their back were taken. There was no return from the medical building. At first those prisoners were sent to camps where their was a gas chamber or they were killed by lethal injection. Eventually Mauthausen got their own small gas chamber and crematorium to take care of their own. 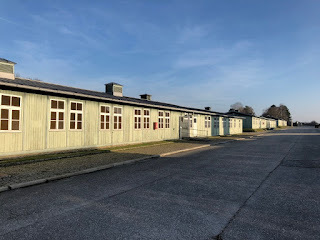 We were left on our own to explore the museum buildings that contained pictures and memorabilia from the camp. There were too many stories to read in the time we had but one that was outstanding was a good one. One survivor of the camp was given a bicycle by nuns in Linz. He did not want to wait for everything to be organized for his return to his home in Poland. Together with two other survivors, they set off with the bicycle on the long journey home. 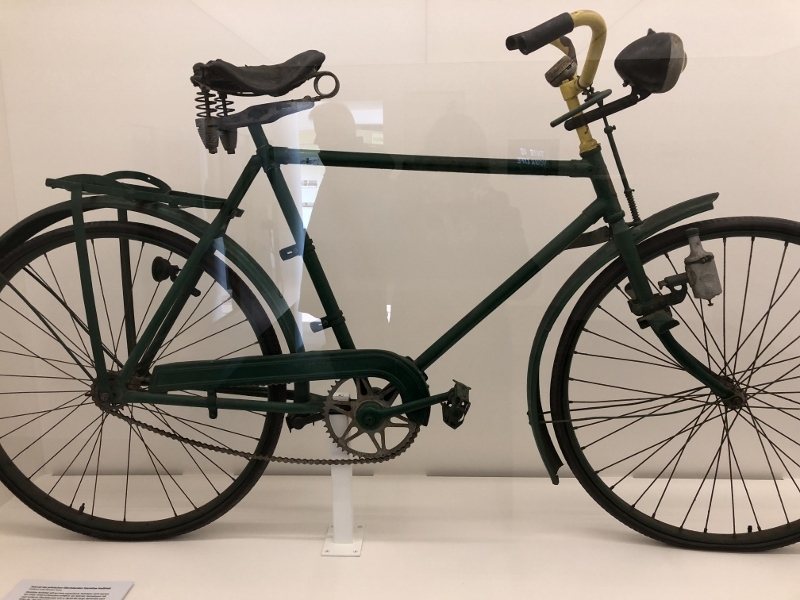 He kept the bicycle until the end of his life as a memento of his trip and it was eventually donated to the museum. Prisoners wore labels on their striped clothing and were classified as Political, Professional Criminal, Emigrant, Jehovah’s Witness, Homosexual and Antisocial. 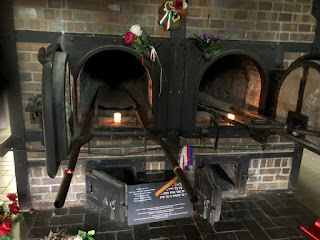 There were also special markings for the Jews (star of David), Poles and Czechs and other small groups of prisoners categorized in various ways. The business of the camp was to send the granite mined from the quarries up the river from there to where they would be made suitable for sale to construct buildings and such. Basically the camp was economically successful and lined the pockets of some of those in power. 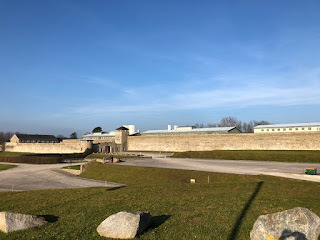 Someone asked the question of our guide about what the village of Mauthausen thought was going on here. While he said it was not an excuse, he asked us to put ourselves in the shoes of those in the village at the time. Most of the men were off fighting in the war which left women at home trying to feed children. When the soldiers demanded food for the camp there was little they could do to refuse. They needed to provide for and protect their children. Thought provoking at the least. Our group eventually returned to the bus as the sky was getting dusky in the early winter evening. One more stop was in store though before returning to the Crystal Mozart and our beautiful accommodations. We stopped at the quarry. 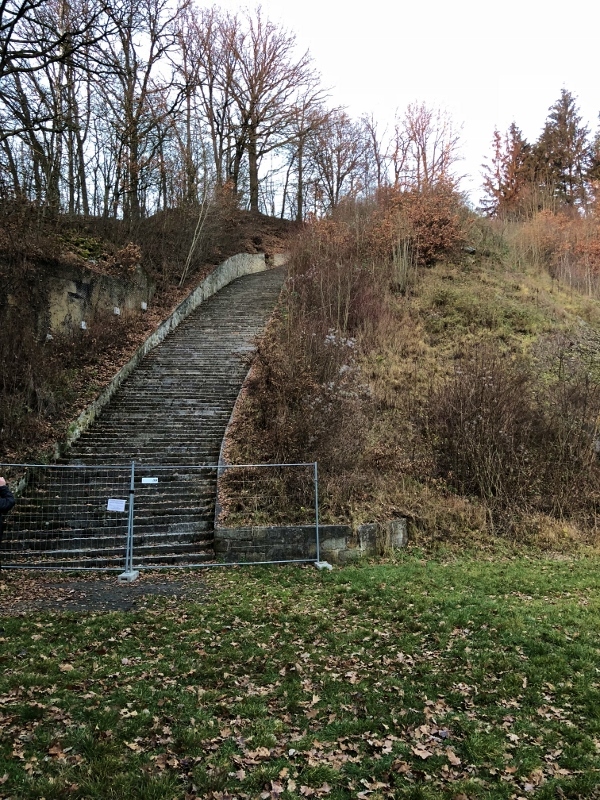 As we stood looking at the 186 Steps of Death that led up and out of the quarry and to the camp, our guide told us how he leads a tour of teens from the high schools who come as part of their education. He first takes them to the quarry and has them climb the steps to the camp. As kids do, he says they start out heartily challenging each other to be first to the top. The further they go, the harder it is, until they reach the top winded and tired and usually ready to listen. That is when he begins the story of how a prisoner with little food in his belly, a cramped space to share with three or four other prisoners in a bed, and with thin clothing that did not protect from the heat or cold would make that climb several times a day and with a huge rock on his back. To stumble and fall could mean a death sentence. The ride back to the boat was a bit quieter.